This 9-unit condo building at East Pine and Summit is a good example of how infill development can be done with minimal impact on neighborhood character (unlike the project soon to rise one block to the east). 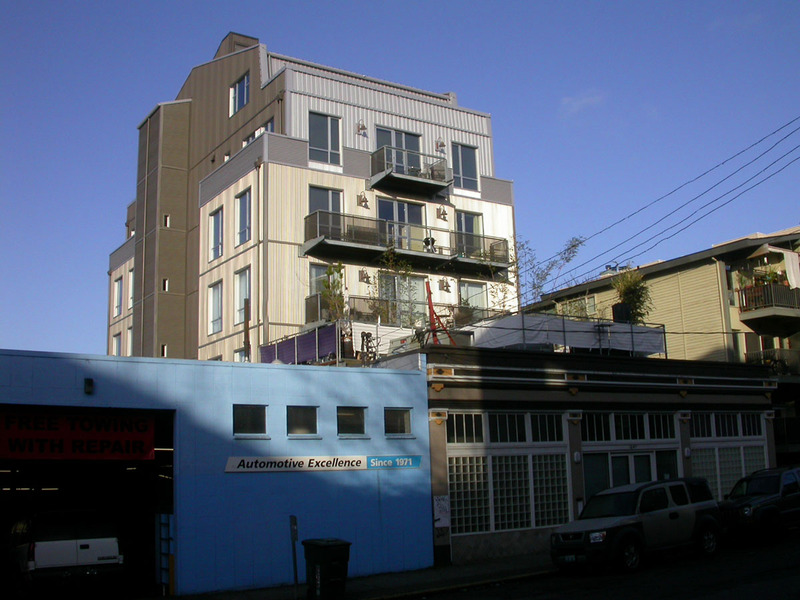 Tucked in behind a classic old storefront and an auto repair shop, it has no direct access to either Pine or Summit. I went past it dozens of times on Pine Street before I noticed it. Good stuff designed by Runberg, who we’ll be soon be seeing a lot more of up the street. Posted by dan bertolet on	Wednesday, February 13th, 2008 at 10:04 pm. You can follow any responses to this entry through the RSS 2.0 feed. You can leave a response, or trackback from your own site. Enough on the Runberg hype. Please look at that building close. Mediocre at best. Hey there steve, my “good stuff” remark was in reference to how the building fits into the neighborhood, not the architecture of the building itself. That it’s Runberg is just coincidental. What don’t you like about the building?